Charleroi is a big city in Wallonia Belgium, located at half an our driving from the French border and less than an hour driving from Brussels. Next to its industry, Charleroi is also known as the capital of Walloon cartoon illustration, which the city refers to by means of paintings, images and even full size cartoon character statues! Did you discover surprisingly Charleroi already and are you moving to Charleroi? Welcome to Henneken! With our removal company, your removal to Charleroi is in good hands. Is a removal company’s reliability important to you when you are moving to Charleroi? Since our removal company was founded in 1870, we have 150 years of removal experience! We nowadays carry out approximately 300 removals each year between the UK and Belgium or the Netherlands. With experienced and qualified removers, a modern fleet as well as reliable equipment, we are pleased to help you moving to Charleroi comfortably. Since we are that experienced, people and companies are very satisfied with our removal company, which is one of the reasons why Henneken is preferred to other removal companies when people and companies are moving to Charleroi. Moving to Charleroi? Comfort yourself with our excellent service! Are you moving to Charleroi from the UK or Ireland? Then you are likely to appreciate a reliable removal company as well as excellent removal services. After all, a removal is one of the most stressful activities in human life. Therefore our removal company offers excellent removal service, in order to comfort you when moving to Charleroi. Our services include for example handyman service, storage service and many other services that turn moving to Charleroi into a pleasant and comfortable experience. Please be sure that our professional removal team takes the best care possible when you are moving to Charleroi! Comfortably moving to Charleroi? Request our free removal checklist! Since a removal is proven to be among the most stressful events in one’s life, moving to Charleroi is likely to bring lots of stress. Therefore we would like to ease your removal to Charleroi as much as possible. Did you know that we, for example, share our extensive removal experience with you by means of a free removal checklist? Request this checklist by contacting us and benefit from useful removal tips, based on 150 years removal experience! Moving to Charleroi for a year? Save money with groupage shipment! Sometimes people are moving to Charleroi for only a short period. In those situations, the number of objects that should be shipped is often limited to only a few. Are you also moving to Charleroi with only a few objects? Groupage shipment may be a perfect solution in order to save money! With groupage shipment, we ship your objects together with other’s, which enables you moving to Charleroi in a professional and cheap way. Please do not hesitate either to contact us or to request a removal quote if you are interested in groupage shipment! How can we help you moving to Charleroi? Request a removal quote! Do you have any questions about how we can help you moving to Charleroi? In case you have any questions about moving to Charleroi, please contact us: call us (+31 (0)79 – 361 13 68), send us an e-mail (sales@hennekenremovals.co.uk) or request a removal quote. You will receive a removal quote within two days after we receive your request. Would you like a free pre-move survey visit by one of our surveyors right away? Please do not hesitate to contact us in order to make an appointment. Do you want to know what your removal to The Netherlands will cost? 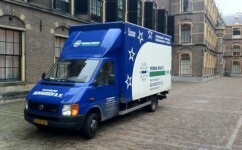 Over 300 removals a year between the UK and The Netherlands. Combinations are cheaper! We are a Dutch company! Planning to move to the Netherlands? Let's go Dutch! Save money, get a quote now! Will you be needing storage in The Netherlands in a modern facility? Get a quote now!